This week on Keeping Up With The Kardashians Kim is on the rampage when she finds a girl in Scott’s room. She tells Scott “We’re gonna go by ourselves and I’m gonna enjoy the rest of my time in Dubai.” Scott is upset. He says “What?” Kim tells him “It is not ok that you made me feel bad for you when you heard a rumor about Kourtney and another guy.” Scott says “It wasn’t a rumor.” Kim disses him and everyone heads out on the adventure without him. Everyone is boarding the flight to Costa Rica. They are flying on two seperate planes. Kendall and Rob did not make the trip because Kendall had to work and Rob is busy with Dream. Kourtney is not happy that Scott is on the trip and Kim is still dealing with her worries about meeting with the French judge in New York to give her testimony. 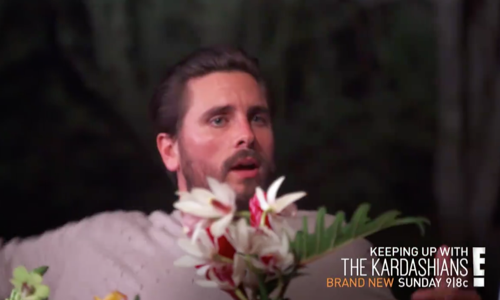 Kris is also still upset about Caitlyn’s book. When they land Khloe and Kim are talking about the situation with Kourtney and Scott. Khloe says “They are separated and they can do what they want, but she leads him on. They take vacations together and it definitely gives him the wrong idea.” Kim agrees. They get to the house and everyone is amazed. Khloe has arranged for there to be a special show of fireworks and the kids love it. Scott is not staying at the house. Corey asks him “You’re not staying at the house?” Scott says “No. I am staying at a hotel down the street because it is annoying that the girl that I used to be with is right down the hall and I can really start to annoy myself.” Meanwhile, Khloe gets upset when Kylie and Tyga try to hijack the bedroom she has already chosen for herself when she picked out the house. The next day Khloe is in a much better mood. She asks Kris “How long have you and Corey been dating?” Corey tells her “Three years.” Kris moves off to the side and Khloe asks her “How come you’re sitting over there?” Kris just wants to relax. Kris asks her about Cleveland and Khloe tells her “It’s great. I would take him on a private vacation, but I don’t want him on camera anytime soon. Our lives are so great right now.” Kris agrees.